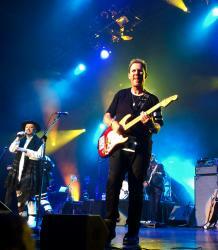 Noelle Stevenson, CVB&apos;s Vice President of Film, Music, Entertainment & Creative Industries, interviews Culture Club&apos;s lead guitar play, Roy Hay. Culture Club performs at the Broward Center for the Performing Arts July 8, 2016. A. Roy: We have had a great response on the new album. "Tribes" is the original album title we chose, but it might change maybe. We recorded the album in Spain and it was great to get the whole band together again. We recorded the album 2 years ago. As part of the tour we will be playing the new songs and the old - a blend of nostalgia and new sound but it will still sound like Culture Club! Q. Noelle: How many shows will you be playing during this world tour and how many countries? As far as U.S., how did you pick Fort Lauderdale? After all, the 80’s were hot and steamy down here! A. Roy: Love Fort Lauderdale! We played down here last in 2000. It&apos;s always nice to be back in a beach city! We also played in Miami, but it is a bit weird down there, more of a party town. Fort Lauderdale is organic, I would move there! I remember before we left Fort (Lauderdale) we had a crew of 25 that went to this great southern restaurant - it was called Shack something. Q. Noelle: How does it feel to come together as a full band again? We hear last year’s USA tour was a great success, how do you anticipate the world tour going given Culture Club has had such a great impact in countries like Japan, UK, France, Italy? What other cities in the USA are you looking to play? A. Roy: It feels great to come together as a band again! We are going to be touring for 6 weeks all over in the USA. Q. Noelle: Have you ever performed in Greater Fort Lauderdale during your America tour? Any favorite spots? Hang outs in Broward County? Favorite hotel or restaurant? What is your favorite thing to do down here? A. Roy: One of my favorite things in Fort Lauderdale are the golf courses! !